WPA radius is a wireless network system that has an existing decryption on WEP (Wired Equivalent Privacy), WPA even though the radius is a network security system was pretty good but still cracked or intercepted, but it took much longer period than WEP. Captive Portal is an authentication technique and security of data passing from the external network to the internal network. Captive Portal is actually a router or gateway to protect or not to allow any traffic, to the user registration. Usually Captive Portal is deployed on wireless infrastructure sseperti hotspot areas, but did not rule applied to the cable network. Here's how the Captive Portal: When a user attempts to browse to the Internet, captive portal will force an unauthenticated user who has not been to an Authentication web and will at the login prompt and hotspot information about what he was using. 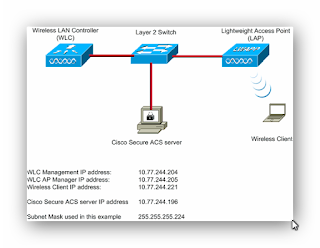 Router / wireless gateway has a mechanism to contact a server to find out the identity authentication of wireless users connected, the wireless gateway will be able to determine to open his firewall rules for specific users. A captive portal turns a Web browser into the device authentication. This is done by intercepting all packets, regardless of address or port, until the user opens the browser and try to access the Internet. At that time the browser is redirected to a web page that requires authentication, or show only acceptable use policy and require the user to agree. Addres MAC filtering is a method of filtering to restrict access rights of the MAC Address is concerned. Almost every wirelees access point or router is facilitated with good security in the WLAN, as sensitive to the type of interference, such as theft pc card in the MAC filter of suatuaccess point sniffing the WLAN. MAC filter function to select which computer to be entered into the network berdasarkanMAC Address. If not registered, will not be able to get into the network MAC address filter will restrict users to access the wireless network. The MAC address of the device user's computer will be registered in advance to be connected to the wireless network. As one alternative to reduce the weaknesses of wireless networks for. Almost every wireless access point or router with security facilitated MAC Filtering. It's actually not much facilitated by the MAC filtering security. It is not actually much easier dispoofing or even altered. Tools ifconfig in OS Linux / Unix or a variety of tools such as network utilities to, regedit, SMAC, machange on windows OS easily be used for spoofing or change the MAC address. To change the MAC address of the network interface, just use simple tools like MAC MakeUp. In computing, wireless intrusion prevention system (WIPS) is a network device that monitors radio spectrum for the presence of unauthorized access points (intrusion detection), and can automatically take precautions (prevention anintrusi). The main objective of the WIPS is to prevent unauthorized network access kejaringan local area and other information assets by wireless devices. These systems are typically implemented as an overlay to existing Wireless LAN infrastructure, although they can be deployed independently to enforce no-wireless policy within an organization. Some advanced wireless infrastructure has been integrated WIPS capabilities.